The honor of Valedictorian is awarded to all seniors that have attended MCC for a minimum of three consecutive years. The students must have earned a weighted cumulative GPA of 4.0 or above for seven semesters. Also, they may not have a letter grade of C or lower for a final semester average on the MCC transcript through seven semesters. 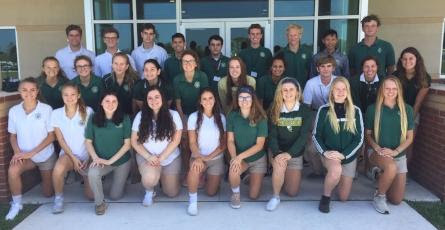 We congratulate the following seniors who have met these criteria: Taylor Arnold, Ayla Baker Kural, Ben Diaz, Alex Fleis, Haley Gardner, Shea Justin, Sean Kelly, Nicholas King, David Kirkendall, Sophia Krebs, Ashley Lamarre, Claire Lockhart, Liam Lundy, Mary MacKay, Jenna Maffei, Matthew Manley, Abigail McDougall, Rachel McDougall, Sarah Mieczkowski, Jose Mejia, Bayleigh Perez, David Stein, Camille Stimpson, Sara Sutton, Anna Sutton, Rachel Thomas, Tierney Wixted, and Jennifer Volk.